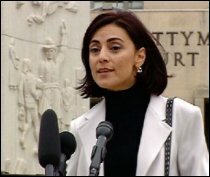 FBI whistleblower Sibel Edmonds has gone further than ever before about what she discovered while working as an FBI translator. In a groundbreaking report in the Sunday Times yesterday, Edmonds reveals that she had first-hand access to evidence that Israel, Pakistan and Turkey have high-level moles operating in some of the United States' most sensitive nuclear facilities, and that they were aided by a "well-known" State Department official. The article details how the State Department official accepted bribes from the Turkish diplomatic community working on behalf of Pakistan's intelligence service, the ISI. These nuclear secrets were then passed on to A. Q. Khan, who in turn supplied nuclear secrets to Libya and Iran, and was reported to have met with Bin Laden shortly before 9/11. The 9/11 link to this story is perhaps even more startling. Edmonds asserts that the head of the network of moles was none other than General Mahmoud Ahmad, the former head of the ISI and the man who wired $100,000 to the lead 9/11 hijacker and then just happened to be watching the events unfold over breakfast with the chairman of the House and Senate Intelligence Committees. Douglas Feith: Under Secretary of Defense for Policy, 2001-2005; head of the Office of Special Plans (Pentagon intel/propaganda unit accused of using forged evidence); JINSA. Eric Edelman: Principal Deputy Assistant to the Vice President for National Security Affairs (2001-2003); former U.S. Ambassador to Turkey (2003-2005); current Under Secretary of Defense for Policy. Marc Grossman: United States Under Secretary of State for Political Affairs (2001-2005) Met with Pakistan's notorious intelligence head, General Mahmoud Ahmed, just before September 11, 2001. Brent Scowcroft: Chairman of the President's Foreign Intelligence Advisory Board (2001-2005). Founder of the Scowcroft Group and The Forum for International Policy. It remains unclear whether these revelations are linked to earlier revelations that a company related to former Defense Secretary Donald Rumsfeld was selling nuclear secrets to North Korea. Edmonds has been gagged from telling what she knows about information she discovered relevant to the 9/11 affair and FBI investigations into foreign agents. Her testimony in public hearings was retroactively classified by Ashcroft, who feared that the information she possessed was a threat to national security.